To maintain the financial system, most educational institutions use Tally.On the other hand, Fedena allows you to maintain all kinds of financial transactions like payment of salary, fees transactions and a whole lot of others. But when you want to transfer all transactions from Fedena to Tally, you cannot do that manually. Instead, you can use the Tally plugin by Fedena which is nothing but a bridge between the two. Once it is synchronised,all financial transactions will be copied from Fedena to Tally. 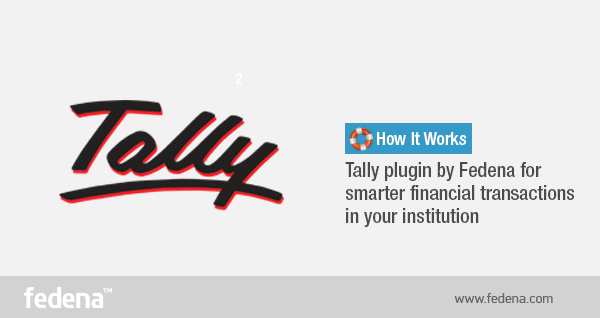 To know more about the Tally plugin, read on this article. Login to your Fedena account and go to ‘Tally Export’ in ‘Finance’ that can be found in the main menu. Once you click on ‘Tally Export’, you reach the ‘Tally Export’ page, a screenshot of which is given below. ‘Tally Export’ offers you four options. Let’s see how the options will help in using the plugin. Settings: Click on ‘Settings’ and you get the options to manage settings for the tally export. ‘Settings’ allows you five options to manage it. For configurations, you need to select ‘General Settings’ to include tally url and live sync start date. The ‘Organisations’ option lets you manage your organisations for which, you first need to ‘Add’ your organisation’s name to it. ‘Voucher Types’ lets you create and edit all types of vouchers. Similarly, the options ‘Accounts’ and ‘Ledgers’ allows you to manage your Tally accounts and the ledgers for Tally respectively. You can create, view and edit ledgers for Tally with the ‘Ledgers’ option. Manual Sync: When you want to synchronize with Tally manually, you need to choose the ‘Manual Sync’ option. Click on ‘Manual Sync’ and select the start and end date for the manual synchronisation. Click on ‘Schedule’ and you see that manual synchronisation has been scheduled successfully. Bulk Export: The ‘Bulk Export’ offers you two options for the export. You can schedule a bulk export for Tally, using the ‘Schedule Export’ for which you need to select the start and end date and also the ledgers which can be some selected ones or all of them. For downloading any pre scheduled export, go to ‘Downloads’ and you can download the export in XML format. Failed Syncs: All failed synchronizations can be obtained from ‘Failed Syncs’ option. Just select the date for which you want to know the failed syncs.